If you’re reading this, chances are you are part of the curious and entrepreneurially ambitious lot that every now and again checks for available local domain names on the ZISPA website. And if you did so over the past couple of days, you we probably frustrated to find the site was down. It’s not just you, it’s down for everyone. In the past, ZISPA being down meant you were pretty much stuck. Not anymore, thankfully. Not only can you check for the domain using sites like name.co.zw, you can buy it using mobile money too almost immediately! This is not the first time the website has been down. Update (17 Feb 2014, 2PM): the website is back up! they must be “updating” the website again…. ZISPA’s website is now back online. 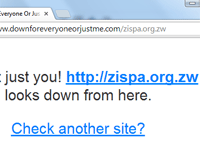 Wow they have refreshed the look of the ZISPA website. Nothing changed from where we’re browsing… What new stuff you seeing? Wow, great job. great looking site!!! Guys who’s doing this, who runs ZISPA anywhay?